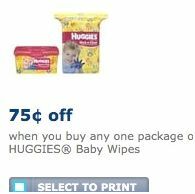 Go here to Coupon Network to print a $0.75/1 Huggies Baby Wipes coupon. And Target also has a $0.75/1 manufacturer coupon here. Both Target and Walmart sell the 16-count Huggies travel package of wipes for $0.97 making it only $0.22 with a coupon. Thanks, Printable Coupons and Deals and Money Saving Mom.